This content is © 2019 Calistoga Camera Club | All rights reserved. These instructions cover any of the reasons you might be submitting content to the club: slide show, field trip, other event, etc. Specific details about the upcoming slide show will be sent to you by e-mail. All images must be in the JPEG format, sized to fit within a 1600 x 1600 (width x height) pixel area. File names should NOT include special characters. Limit file names to letters, digits, spaces, under-bar, and dash. 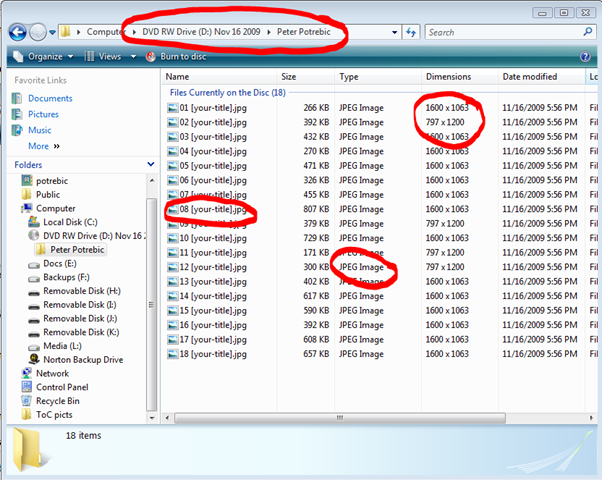 You MUST place the images inside a folder. The name of that folder should be your name, first name followed by last name, and only your name (e.g., John Sullivan or Chick Harrity). You may, if you choose, produce a video (quicktime, mpeg, etc). This allows you extra dimensions in creativity (music, captioning, panning, zooming, transitions). But please, this is a still photography show, so no true video. Materials (CD or DVD) should be dropped off at 1907 Cedar Street in Calistoga. If no one is home put the materials inside the little school desk next to the front door. Submitted material will be available for pickup after the event. Special arrangements can be made ahead of time. If you need help with any of these instructions please email the club at info@calistogacameraclub.net. 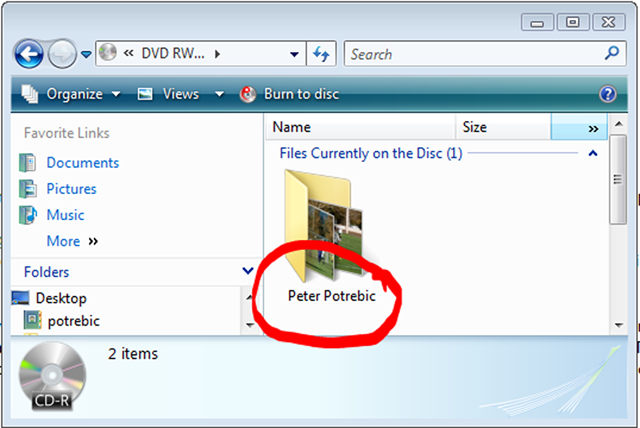 Notice that there is a single folder on the CD/DVD, and that folder’s name is YOUR NAME (Peter Potrebic is used as the example). We’re looking at the contents on the folder (whose name is your-name) on the CD/DVD. Image sizing: Your images should be sized so that they are no wider than 1600 pixels and no taller than 1600 pixels. The Dimensions column in the above screen shot is showing the width x height of each image. Notice how the images are properly sized. File naming: If you want your images in a particular order than they must be named so that they alpha-numerically sort in your desired order. This is easily done by prefixing each image with 01, 02, … as shown above. Of course the [your-title] text shown above is replaced with the actual title. File type: The images must be of type JPEG. If the submission is for a slide show, there will be some limit to the number of images. Currently that limit is 12, but see information about the specific event for precise details. The images must be in the JPEG format. The images should be sized to fit inside a 1600 pixel wide and 1600 pixel tall box. Said another way the maximum width is 1600 pixels and maximum height is 1600 pixels. This is very important if you want your images displayed in a specific order. Name the images so that they alphabetically sort in their display order. Usually this means adding a prefix like “01, 02, … 09, 10, 11…”. The leading zero is important. The names should not have special characters. The special characters can cause problems on the website (for example ‘#’) so stick with the basics. Most Quicktime and MPEG formats should work fine. Your video is limited to 4 minutes. Let the club know you’re doing a video and try to submit early so that any kinks can get worked out.